Buying an aquarium can be a fun and rewarding experience for almost anyone. However, if you’re a beginner, the first steps can sometimes seem frustrating; which fish tank do you choose? How do you set it up? In order to help you with your decision, we’ll reveal our top 5 best fish tanks for beginners. Can be a saltwater or freshwater tank. Comes with a wide range of equipment. Comes with equipment, as well as fish food and a water conditioner. Can be turned into a freshwater or saltwater tank. Comes with: an LED lighting hood, a filter, a mini heater and 4 artificial plants. Filter and multi-colored LED lighting system included. 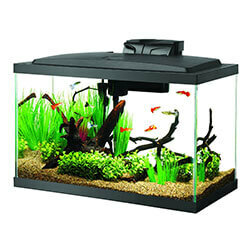 Although a small fish tank may seem more practical, larger tanks are actually easier to maintain. The smaller a tank is, the less forgiving it is to subtle changes and possible mistakes (and you’re bound to make some if you’re a beginner). Temperature changes, change in oxygen supply or chemical element deficits all happen much faster in a tiny aquarium. Because of this, the best fish tank for beginners should ideally be at least 10 gallons. 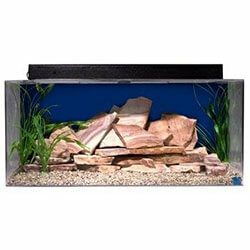 Fish tank kits are usually the best choice for beginners. On one hand, they’re very convenient since they usually come equipped with everything you need – and they aren’t too expensive. However, they do have their downsides. While an aquarium kit spares you the hassle of choosing your first filter, the gear that comes with it is often of low quality – most kits won’t allow you to keep a lot of fish/demanding plants. 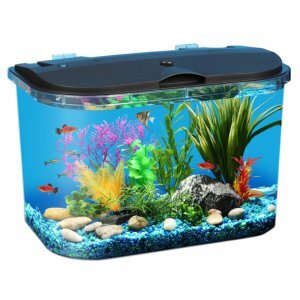 We tried to find aquarium kits that don’t just meet the minimum with their included equipment, but instead offer good quality and open up a lot of options. Although they’re not essential, a few little extras can be of great help to someone completely new to the hobby. We also took basic necessities like food and decor into consideration when reviewing our best fish tank kits for beginners. Some of the kits in our review come with either real plants (plant seeds) or artificial plants. 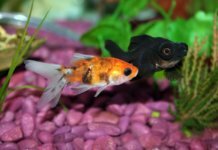 Having both a heater and a filter is an advantage over any standard fish tank setup for beginners, because most of them don’t usually come with both. A lighting system within a fish tank setup for beginners is also very handy if you’re a fan of plants. The LED light stick within this kit is best suitable for GloFish’s specific gravel, which unfortunately doesn’t come with this kit. Even though the LED light stick will illuminate most types of gravel quite well, if you want the best results, we recommend separately getting GloFish’s gravel hand in hand with this kit. 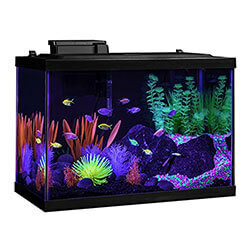 Also included in the kit are 4 plants – 3 GloFish plants and 1 yellow GloFish anemone. 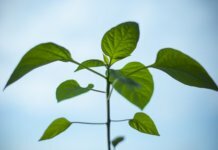 Even if you aren’t a fan of plants, growing these will give you a fun and easy introduction to planted tanks. Are you running low on space and 20 gallons is a bit too much for you? Aqueon’s 10-gallon starter kit is a great beginner setup and our #2 choice. Although its size will allow you to house only a handful of fish and eventually a plant or two, it brings a lot of features to the table – all packed in a smooth, elegant design. Even though these components are fit for a simple and small aquarium setup, what we loved were the little extras that came with this kit; the food, the conditioner and net. It’s a complete all-in-one solution, requiring just one trip to the store. The setup guide is a convenient bonus, too. As far as durability goes, we found that the glass construction of this 10-gallon is fairly sturdy and well-made. The hood has white LEDs which give a nice, clear view. Most fish tanks for beginners come with cheap, noisy filters – thankfully, this isn’t the case here. We found the included filter to be pretty good – and impressively quiet. Finally, a 50W preset heater is included, which is quite handy, especially if you live in a colder place. If you’re a more courageous beginner or a seasoned pro who wants an average-sized fish tank, the Seaclear 29-gallon kit seems to be worth a shot. Although a tad bit more pricey than some alternatives, we found that it offers good value for the money. The artificial plants are a nice touch, especially if you’re a beginner – even though live plants look better, they’re more complicated to tend to. Live plants also require lighting, and that’s unfortunately something that this fish tank doesn’t come with. It does come with pre-installed fixtures for 24-inch fluorescent bulbs – which gives you some space to choose if you go down the live plant route. You have several fish options to choose from when dealing with an almost 30-gallon tank, so it’s up to you to choose between a saltwater or freshwater setup. No matter what your preference is, you’ll save money on maintenance gear thanks to the included water conditioner and power filter. 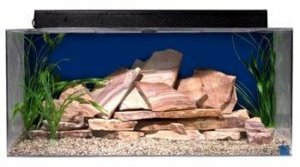 To sum up, if you don’t mind splurging a little and want a smart beginner fish tank that will be fun to tend to, this is a great choice. 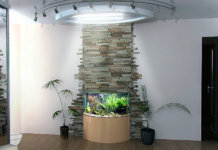 Tetra specializes in anything you can think of within the world of home aquarium systems and their equipment. 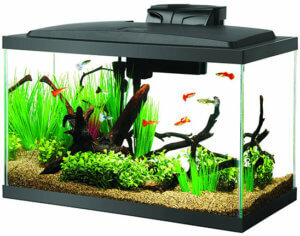 Although this is a great fish tank setup for beginners, it’s also a good choice for long-time fans of the Tetra brand. 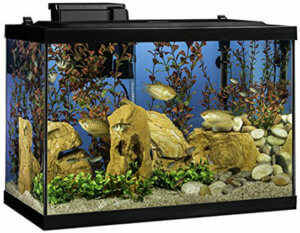 Made in the USA, Tetra’s aquariums are all encased with thick, scratch-proof glass. 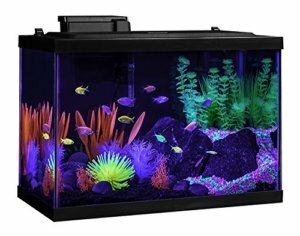 So if you want safety – but don’t want an acrylic tank, this is a solid pick. Its size is decent for a couple of plants and fish. Next to that, its overall shape is great for a full tank view without taking up much space, which some might appreciate. The lighting hood is designed to accommodate LED lights. It’s extremely easy to open, making regular maintenance and feeding a breeze. Although the mini heater isn’t a crucial component, it’s certainly useful if you want to house some tropical fish species. Last but not least, the artificial plants will give your tank a natural finishing touch with zero hassle. 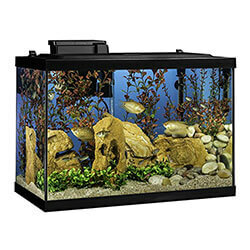 If 20 gallons is simply too much for you and you plan on keeping a few (or just one) non-demanding fish, this 5-gallon is a solid pick – if anything, simply because of its great value and the solid filter and lighting that come packed into its small frame. Although the tank is made from plastic, it’s far from low-quality; we found the construction to be sturdy, durable – and the view to be crystal-clear. The lighting system consists of multi-colored LEDs which are a pretty fun way to enhance the beauty of the interior. While aesthetics won’t be an issue with this cute tank, neither will maintenance. The internal power filter’s flow rate is 45gph- more than enough to keep the tank’s water clean. Although you won’t find Amano’s aquascape in this little tank, we generally liked its overall design. The hood can easily be lifted, granting quick access to your fish when feeding time rolls around.